Incredible show yesterday at the San Francisco Design Concourse! It brought me back to the first f8 3 years ago, which inspired Faceforce :). Major theme of the day was “the open graph” across the entire Internet that brings structure and semantics to the people we’re friends with and objects we’re connected to. Note: This is going to be HUGE for the semantic web (see my post on this from last September). 2. Social plugins - there are now different add-ons for external web pages which require only one line of html. Eg, display which of a user’s friends has already “liked” the web page being viewed or signed into the site using Facebook Connect, display Facebook menu bar at bottom of your web page which includes chat/notifications/etc. - Platform notifications when user updates profile, adds friends, etc. instead of having to keep polling and diff’ing. 4. Policy changes. No longer a 24 hour limit on storing FB Connect user data! Single unified user permissions screen instead of showing separate screen/dialogue box per permission needed. Very high-energy event. These announcements are very, very good news for brands and developers. It is VERY exciting for the future of the web! And of course great to see Facebook respond to our feedback with their actions without compromising the user experience. 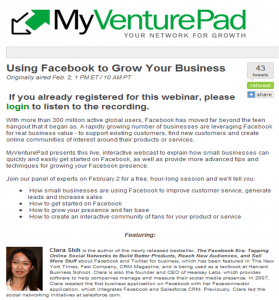 Many thanks to everyone who joined us for our Feb 2 webinar on how to use Facebook to grow your business. I shared some of the insights from my new book, The Facebook Era: Tapping Online Social Networks to Build Better Products, Reach New Audiences, and Sell More Stuff. If you missed it, don’t worry. You can watch the recording here. The main message. As businesses, whatever size or industry we are in, we need to be where the customers are. And it’s becoming clear that the customers are on Facebook! Facebook is an incredible business tool because it has caused people to share more information about themselves than ever before – intimate details about their lifestyles, hobbies, and relationships. All of this information in turn is made available to businesses to target their advertising and messages. Where to begin. It can be difficult and costly to drive traffic to a website. Instead of making your customers come to you, why not go to them on Facebook? A growing number of businesses are creating Facebook fan pages to replicate or even replace the functionality of their website. Here are a few things to keep in mind. 2. What is a fan? Fans can be anyone who chooses to associate with your company: customers, friends, employees, and most of all, potential future customers. The way you attract and retain fans is to consistently publish valuable wall updates which will appear if your fans’ News Feed. What do I mean by “valuable”? Well, instead of going for the hard sell on each wall post, try to link to and write about the things that matter to your customers. Provide helpful information and tips. Let your personality shine through. One small business owner I work with posts a funny joke every week to give his fans a break from their day. 3. How do I get more fans? After you have created a fan page, it’s a good idea to first invite friends, family and employees to become fans (click the “Suggest to friends” link below the fan page profile picture) so that by the time customers and prospects view the fan page, it already looks lively and exciting and they will be more likely to join in. By updating your page consistently- be it once a day or once a week, depending on how much you want to commit- your business can stay on people’s minds by showing up in their Facebook news feeds. Once you establish an expectation of how often you will update your page, make sure to follow through. Telling people about what’s going on in your company, and possibly offering special internet deals, will keep people interested and attract their friends to join as well. 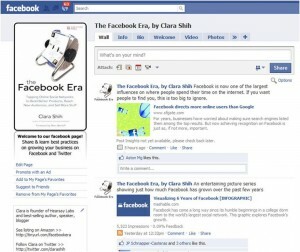 · Facebook communications don’t have to be only business related. Facebook is different than other forms of customer outreach since it fuses personal relationships and business relationships in a way that forward-thinking companies can use wisely. · For example, friendly happy birthday messages to clients through Facebook can make people feel a stronger personal connection to your company, and comments on people’s pages about some shared experience (nothing too personal or unprofessional, of course) can help show your company cares about their personal well-being. I hope this webinar helped clear up some of the mystery surrounding Facebook and how to get started! Feel free to send me your questions on Twitter (I’m @clarashih) or on the book’s Facebook page! The web recording has just been posted for the popular webinar I helped lead last week on “Using Facebook to Grow Your Business.” It features sixty minutes of Facebook trends and stats, specific examples and tips for small- and medium-sized businesses, and a case study from Jonathan Smart, an Allstate insurance agent in Columbus, Georgia who has really embraced Facebook for his business’s marketing and customer service efforts. Many thanks to MyVenturePad and SAP for sponsoring, and to everyone who joined us for the event! 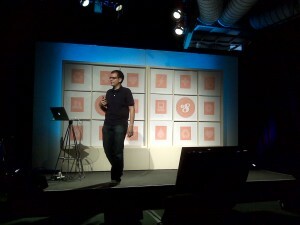 One question that came up during audience Q&A was whether Facebook has utility for B2B. It’s a good question and one I get a lot, so I thought I’d address at greater length in a blog post. The answer is yes. First, B2B sales are all about relationships. Higher price points and longer implementation cycles mean greater buying decision risk, so buyers often rely on trust rather than price. Trust hinges on relationships. Facebook is the ultimate relationship manager. Second, when B2B decision-makers are on Facebook, they are logged in as individual consumers. We have an opportunity to personalize our messages and target these individuals equally for enterprise software as we do for diapers. In particular, many of the sales reps I interviewed use Facebook and LinkedIn together to better navigate buyer organizations, build one-on-one relationships with decision-makers, keep deals alive when a longer sales cycle is required, and prospect beyond direct connections to friend-of-friend networks. Information that people share about themselves on a Facebook or LinkedIn profile, such as someone’s alma mater, hometown, and status update, can behelpful in qualifying leads and used to build interpersonal rapport, for example bonding over having mutual friends or having attended the same college. This was the thinking behind the Faceconnector application I developed two years ago, which integrates Facebook profile and friend information into Salesforce CRM and was the first business application on the Facebook platform. Facebook as personal CRM. Facebook is a contact database with photos, profiles, updates, and birthday reminders to help us stay in touch with more people. The cost of staying in touch has gone down, so we are able and willing to stay in touch with a greater number of people. Our networks are expanding especially on the fringe with weak-tie relationships. Interestingly, business research shows that social capital and consequently business capital are maximized on the fringe. We aren’t usually hiring and closing deals with our parents and best friends – it is with our friend-of-friend networks where the greatest opportunities and gain are to be had. The following is a brief excerpt from my new book, The Facebook Era, about how B2B professionals can utilize social networking tools for prospecting and navigating customer organizations. Purchase decisions are made by individual people, not entire companies. Transactions succeed or fail because of a few key such individuals—your customer champion, executive decision maker, customer reference, sales rep, product expert. By strengthening the bond and improving information flow among your internal deal team as well as with key customer stakeholders, social networking sites can help your company create a more productive organizational selling machine. For example, B2B information technology company Aster Data Systems successfully sourced its initial wave of customers using social networking sites. As a small startup, Aster lacked brand recognition, and did not have the budget for large marketing or advertising campaigns. To source early customers, Aster instead tapped into the company’s collective social network on LinkedIn, MySpace, and Facebook. Senior management asked all employees, not just sales reps, to tap their networks for potential prospects who had keywords like“data warehousing” in their title or functional expertise. In just a few months, the resourcefulness of this strategy has already begun to pay off. LinkedIn and other social networking sites are used to identify who among those contacts connected to Aster employees might be interested in the database product. Then a sales cycle is initiated through a combination of LinkedIn and traditional communication modes. Thanks to the power of the social graph, Aster has successful signed on more than a dozen customers. In addition to helping facilitate one-on-one relationship building, data from social networking sites at a high level can also be used for B2B deal strategy—i.e., how to approach a deal, which individuals at the buyer can be connected with, and who has influence in the deal. Sales methodologies like TAS, Miller Heiman, and Solution Selling emphasize the importance of navigating customer organizations and identifying key decision makers. There is powerful data contained in the online social graph to help aid this exercise. If you’re interested in reading more from this chapter and/or checking out reviews, see the listing on Amazon. I look forward to your comments!